The archetypal image of Valentine’s Day is a heart-shaped box of chocolates. Done right, the box is wrapped in lightly padded vermillion satin, and the chocolates are rich and silky smooth — no grainy cherry filling here. Of course, next to the box is a lush bouquet of fragrant flowers. It’s romantic, timeless, and sure to melt the coldest heart. To me, its perfume equivalent could only be Guerlain Attrape-Cœur. In French, guet-apens means “ambush.” I think Attrape-Cœur (“heart catcher”) is a more fitting name for the fragrance. The difference is subtle, but a heart catcher sounds like something seductive, while an ambush is a dirty trick. Attrape-Cœur is a seductress. I couldn’t find any official notes for Attrape-Cœur beyond “rose, violet, vanilla, woods,” but to me the fragrance is a symphonic floral with amber, vanilla, sandalwood, oakmoss, touches of peach and raspberry, and a pinch of civet. I smell candied violets, iris, rose, and enough jasmine to make its center vibrate. The amber, vanilla, moss, and fruit hint at Rochas Femme and Yves Saint Laurent Yvresse, but Attrape-Cœur is lighter, more floral, and not quite as ripe. A pinch of powder brings to mind silk-skirted dressing room tables. Attrape-Cœur sounds like it should be a whopping grand perfume, but for all its bosomy, ballgowned, François Boucher-minded construction, it wears as light as chiffon. Vol de Nuit Evasion is even more sheer. I’ve been spraying it on shamelessly all week, and the compliments I’ve received have all come after people had been around me for a while, then seemed to awaken to my perfume. It grew on me more, too. I started the week liking Attrape-Cœur a lot. I ended the week loving it. 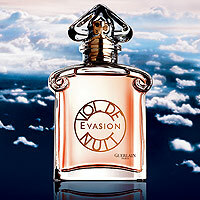 On first spray, Vol de Nuit Evasion is almost identical to Attrape-Cœur. Within half an hour, though, Attrape-Cœur easily overpowers its Eau de Toilette sibling. Attrape-Cœur is more fleshy and rich, and its jasmine and iris are more pronounced. Now for the heartbreaker: Guerlain Attrape-Cœur was discontinued in 2010, and I haven’t heard reports of Guerlain Vol de Nuit Evasion sightings in years. The world needs romance more now than ever. Come on, Guerlain, give us back our Attrape-Cœur. Angela – So many hearts broken over Attrape-Coeur’s discontinuation! I have 2 little decants and will have to content myself with full enjoyment of every drop. Thanks also for the comparison notes with VdNE. It’s such a beauty! And so perfect for Valentine’s Day. I hope your decants are big ones. 10 ml decant purchased, plus a small stash of vials begged from generous swap buddies and SAs. With the miserly way in which I dispense these preciouses, they’ll last me years! I discovered Attrape Coeur right around the time it was being discontinued. I fell it love with it so intensely, that I immediately purchased a few decants…and then a bottle. It quickly became my HG scent, and I love it immensely. If there were only one scent I had to wear for the rest of my life, this would be it. But I love perfume, and prefer not to limit myself to only one scent. What if I tired of it, or eventually became immune to its attraction because I could no longer smell it? The horror!!! So I limit my wearings, pulling it out a few times a month, sometimes a few times/week. I also purchased a bottle of Evasion from The Perfumed Court. It was expensive, but I didn’t care. Glad I did. This was a perfume that really grew on me more as I wore it–although I could imagine overdoing it and not wanting to wear it for a while! I had no idea that Evasion was A-C. Such a shame, I really like this one and have a couple of small decants. I knew about it’s impending discontinuation, but because the Guerlain at Saks is so stingy about samples, and I couldn’t get a swap going in order to test it for several days, I didn’t want to buy based on one wearing since it was so $$…I may regret this just a little:) But, I also have hope that they’ll bring it back in another 5 years! I hope they bring it back, too! Maybe they will. It smells so classic, it’s hard to imagine it disappearing forever. Thanks for the review, Angela. Shame it’s gone. In your opinion, which fragrance would have similarities with Attrape-Cœur? I’m always on a look out for vintage perfumes when I go to antique markets and vintage fashion sales, so I will add this one to my list. Attrape-Coeur is so classical, in some respects, that I’m surprised I can’t think of anything really similar to it. It has some of the floral romance of Chamade, but it doesn’t smell like Chamade, and it has some of the body and heat of vintage Femme, but, again, it doesn’t smell like Femme, either. Attrape Coeur is unique, but you can find shadow resemblances in other iris-themed perfumes. For example: I find a relative in Parfumerie Generale’s Iris Orientale which is less gourmande; another (though many would beg to differ) is 31 Rue Cambone which is more sheer with patouli instead of the rich vanilla-amber base of AC. I read another review of it which compared it to Iris Poudre. I imagine it having the spirit of Iris Poudre (another romantic beauty), but to me they’re not quite the same, either. I would advise checking out the Iris Orientale. Not as “yummy” as AC, but very beautiful, IMO. I haven’t tried that one yet, but the name sure makes it appealing. I find it similar to 31 Rue Cambon too, but AC is sweeter. I’m going to have to try them side by side. Just by memory, I don’t think of them as similar, but obviously they are! I would agree that there isn’t really anything like it. To my nose there’s a slight similarity between the ambery, vanillic bases of AC and Amouage Epic but Epic has a tremendous rose note while AC was more violet-centric. It is kind of amazing how Attrape-Coeur feels like it’s so “eternal” it should be like other fragrances, and yet it’s its own perfume. Well, I am now more relieved than disappointed to have never sniffed Attrape Couer! I am such a Guerlie girl that I no doubt would have fallen in love immediately only to have my heart broken. If they bring it back, I will definitely seek it out but until then I shall remain thankful for small favours! Btw, I wearing the sample of Mecca Balsam that you so kindly included and I am madly in love- a bottle will be mine! Yes, sometimes it’s best not to know what we’ve missed. But at least Mecca Balsam is still around! Gorgeous review, Angela. What a shame about Attrape-Cœur, however. I’m crossing my fingers it hits the market someday once again…. I have the original Guet-Apens in the blue bottle with the dab on stopper. I bought it when it first came out 1999 and it is still beautiful. Wait–let me grab a mirror. Yes, it’s true, I just turned green with envy! My mouth is watering just reading that she has the blue bottle. I saw one of those “lantern” bottles on eBay a few months ago, and it went for over $600! It’s a good thing I don’t have your address…. I’ve lusted after that Guet Apens bottle forever. I actually found a new, full one a couple of years ago – before AC was discontinued – for $400. If I was ever going to buy one, that was the time. That’s amazing! It’s worth more than my car! But also much more beautiful. It’s such a beautiful scent. Why do they discontinue all the best ones? You’ve just written the lyrics to my favorite sad little tune. I read (perhaps on Perfume Shrine) that Guerlain was having trouble sourcing some of the key ingredients and didn’t want to make an “inferior” product. I know we all have thoughts on that, but perhaps they’re more particular about upholding the quality on the exclusive line. Oops – This was supposed to be a response to Filomena’s comment above…. Well, if this is really true, then it probably is for the best. If they did put out something inferior, you know all us perfumistas would be railing on them for the terribly reformulation (a la Diorissimo, etc.). Sad but true. I suppose I’d be first in line, too. That’s certainly the most positive spin on the discontinuation. It also may have something to do with the IFRA restrictions on damascones. If I’m not mistaken, Nahema is also discontinued, and for that reason. I remember smellng this one back in 2000 and thinking it was too heavy for me. Thus, I thought I didn’t like it. (I’m an aquatic/ozonic girl.) Years later, a friend brought me back a Vol de Nuit Evasion from Europe and it immediately took me back to Guet-Apens. Now I appreciate it so much more. VDNE has incredible staying power! I have the blue lantern bottle but it is a factice. The issue of the name, the use of a bottle which is so iconic for two other fragrances, and the label of a third is a valid point. Was this originally intended just for duty free shops? Obviously a new bottle and label wouldn’t have to be designed by sourcing from the archives. Evasion’s meaning is difficult to understand in English. I think it was intended solely for a particular line of duty free shops. Maybe that’s why they didn’t think it would be worth the trouble and expense to make a new bottle and logo. I found Attrape-Couer in NM in mid-2010, after reading of its impending discontinuation, and after one quick test, bought it on the spot, fearing I would never get another chance. I do tend to find it a little too heavy for hot weather, of which we have plenty in Texas, but in cool weather it is beautiful. It should be beautiful right now, then! The first time I tried AC I thought I was in trouble since I found the candied violets on vanilla base likeable enough to potentially be FB worthy. Unfortunately (or fortunately), on the consecutive wearings the violets never quite made the same appearance again and the base alone just didn’t seem enough. Nevertheless, I’m still sad to see another good scent go while mediocre flankers seem to be mushrooming exponentially. Heartache averted! I agree, though, I’m tired of generic flankers. Oh, I know! Surely there’s a rich old geezer out there with bucketloads of $$ to spend on discontinued perfume for me. Surely. LOL! You need to be in my industry (Thoroughbred race horses) – no joke, I was offered a Renoir way back in the day when I was young and cute! But even at 21, I remembered the old saw about quibbling over the price and so declined. It sounds like a novel! Rich, old thoroughbred owners and gorgeous young trainers. Aaaagh! I was totally sold on this one. You know that YouTube video of the dog listening to talk about a nice steak, salivating more with each detail? That was me. Especially at the end. I love that video! I know exactly the one you’re talking about. And as a dog owner, I felt every smacking of the jaw, every turned away head in full force. It really is torture to review these discontinued fragrances. But they deserve so much respect! Angela, you tease! Dangle those lacy underthings and then walk away; I see how it is! Hey, I feel the pain as much as you! Great review, as always. I fell hard for Attrape Coeur after a NM SA gave me a random sample I hadn’t even asked for. When I heard it was going away I fairly ran back to buy it. I love it dearly and have a travel spray in my purse to just be able to enjoy it randomly. That’s perfect! I feel like I got to know Attrape-Coeur too late, really. But I love the thought of you taking a perfume-romance moment of a spritz of Attrape-Coeur in the middle of traffic or in the restroom during a trying date or at home as you collapse on the couch with a good book. Attrape Coeur catched my heart on the very first sniff. It had just been discontinued when I first tried it, but I was lucky enough to find three bottles, which I store with care and love, like a precious treasure. While I see how attrape coeur could make a perfect Valentine’s day perfume, for me it is the smell of fall and early winter, with its violet-tinged liquorous warmth. It makes my perfect Christmas scent! A very nice Christmas scent! I fell for Attrape Coeur at first sniff. It was 2007 and I was in the early throes of sample mania, buying a handful from the Perfumed Court every month or so. 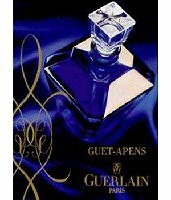 I don’t know what prompted me to buy a sample of AC since on first glance it’s not really my thing but on the other hand I love the classic Guerlains. I carried that sample with me EVERYWHERE and determined that I would buy a bottle when the opportunity arose (in the end I was gifted with a bottle which makes me a very lucky person but that’s another story). I love how on different days I can pick out either jasmine or iris or violets swimming around in liqueur. Just beautiful. Lucky you! It really does sound like love at first sniff. I made a pilgrimage to Guerlain on the Champs Elysees specifically to sniff this just to find I had missed it by a couple of weeks, only an afternoon in the Les Salons du Palais Royale managed to cheer me up… I love Guerlain, I love vanilla and I love violets – this really should be mine! They have brought it back once so you never know, I for one will be keeping my fingers crossed. Drat, you missed it! But as you say, you had a nice afternoon consolation. I’m crossing my fingers, too, that it comes back. It was indeed only for Duty Free – the French use the word ‘Evasion’ to mean ‘take a trip’ (you see it as a car name, a bit like ‘touring’). I found it to be very sweetly ambery, very radiant and long-lasting. I felt there was a certain something it had in common with Guerlian’s Terracotta Voile d’Ete – something in the base – that shared those sweet radiant amber elements, though obviously VDNE had the addition of rich floral notes that rounded it out. It was that sweet radiant element that I found offputting and too ‘loud’ for me. In ‘volume’ I found it rather like Samsara – very lasting and quite noticeable even to the wearer. It is sweet, there’s no getting around that. That’s why I think of the box of chocolates. But, hey, you probably made someone else happy with your cast off bottle! Thanks for the definition of “evasion”. Now it makes sense that it was for duty free shops! Angela: Your description of AC/G-A (and VDNE) as being ” an eternal fragrance” is a very good one. And hopefully it will return and prove me right. Wonderful, scintillating review, Angela. I have a funny history with AC – I bought a decant, decided it was too sweet (I’m not a huge violet fan and they really bloom on my skin), and passed it on. About a year later, the recipient sent it back to me. For whatever reason, it was love, and I ended up buying more. I’m so glad I did as it is a gorgeous, timeless scent. Thank goodness for second chances! Well now then – Thank Her Magnificent Highness…. That’s funny! You know, some of the best things in my life have come from second chances. Given the timing of the Attrape-Coeur discontinuation, I had assumed it was discontinued due to the most recent IFRA restrictions. You may well be right. Some of the other commenters brought that up. Thanks for clearing the confusion, Angela. I have always been somewhat perplexed by their likeness and now I see why I love them both, but unfortunately don’t own a bottle ($$$). Come on, Guerlain! I cherish my decant and don’t have a bottle for the same reason. We can cross our fingers for a reissue! I vow to find 3 vintage bottles this year. It’s a mission. I am going to ask Our Lady to intervene for me. I never ask for much for myself. But just recently she and St. Monica intervened and I recieved two miracles in one day. I’m on a holy mission. Let me know if it works, and good luck finding some wonderful vintage Guerlain! Plus, I spilled some on my laptop.